Luang Phu Khui Tidtatammo, deceased Master of the Petchaboon Province, was a Gaeji Ajarn whose powerful Magic became very famous some years before his passing, as his amulets, and his fame reached other provinces, and eventually to foreign shores, and the immense success experienced by those who worshiped them began to cause stories of Miraculous success to flow back to the temple from around Thailand and even other countries such as Singapore and Malaysia. 2. (top right of tree); Luang Phu Sukh (Wat Pak Klong Makham Tao) – Passed Wicha on to Luang Phu Maha Po, and to Luang Por Mui, through their respective Kroo Ba Ajarns. Both of these Masters passed the Wicha of Luang Phu Sukh on to Luang Phu Khui. 4. (center right); Luang Por Mui (Wat Don Rai), passed on his Wicha from his Kroo ba Ajarn, Including Wicha from Luang Phu Sukh. 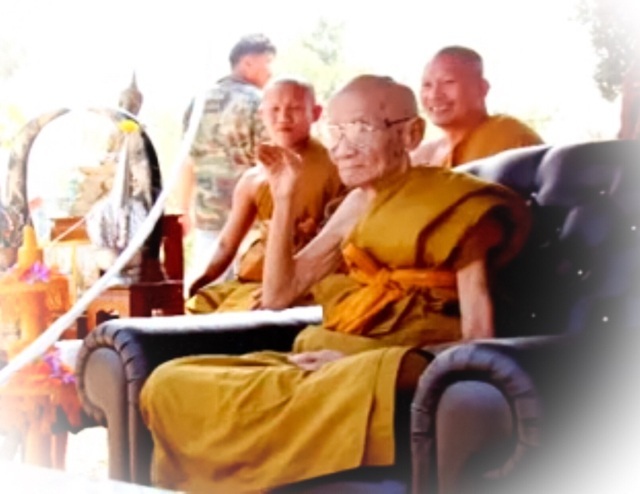 Luang Phu Khui was born with the Name Wichai Rat, on Wednesday the 20th May 2464 BE, in Petchaboon, his Father’s name was Mr. Tong Dee, and his Mother’s name was Mrs. Tong Sukh. with the Surname of ‘Dton Tong’. It is said that Luang Phu’s true birth date was ten years before, in 2454 BE, but that in those days, it was so difficult to travel through the forests to the main towns to register a birth, that he was not registered until ten years later. Luang Phu was a friendly child and helpful to others, and was loyal and truthful. he liked to practice chanting the incantations and Buddhist mantras his Father taught him, and was very diligent and put his heart into the things he did. When Luang Phu Khui reached the age of 12, his Father died, and Luang Phu was ordained as a Samanera Novice Monk in front of the Funeral Pyre of his Father, to pay respects and make merits for him. However, even once the Funeral and Mourning Time was over, Luang Phu declined to disrobe, and asked to remain ordained. Luang Phu Khui had heard of the Merits and Attainments of the Great Luang Por Tob, of Wat Chon Daen, and travelled to Wat Chon Daen, to ask to serve under him. He served Luang Por Tob cleaning his almsbowl, taking care of the betel and areca nut paraphernalia, and making sure Luang Por Tob’s Kuti was well kept and swept. Luang Por Tob was highly impressed with the selfless diligence and intention to be helpful of the young Samanera Khui, and began to bestow Wicha and teachings upon Samanera Khui. He revealed the methods of the Takrut Tone, Powerful and Proper Inscription of Yant and Agkhara spells, Pha Yant, and other amulets. He taught Luang Phu Khui Vipassana Kammathana methods to master his mind and control the Psychic Abilities. He taught Luang Phu Khui the Wicha Sek Khaw Sarn Hai Gai Kin (enchanted rice grains to give to a hen), and the intensive detailed methods of making Pra Kring Cast metal Buddha Statuettes. All of this was happening as Luang Phu was still only a Samanera Novice Monk, but he was already becoming immensely Adept at these Wicha. 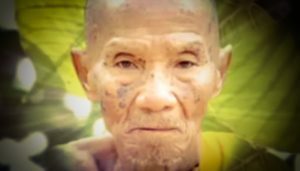 When Luang Phu Khui reached the age of 22, he was re-ordained up one grade to the status of a fully fledged Bhikkhu Monk, at Wat Sri Mongkol, on the 4th March 2486 BE. with Pra Maha Yuak, the Bishop of Amphoe Lom Sak, as his Upachaya Ordaining Officer, Pra Atigarn Kampan as his Gammawajajarn Promting Officer, and Pra Atigarn Wan dee as his Anusawanajarn Witness. 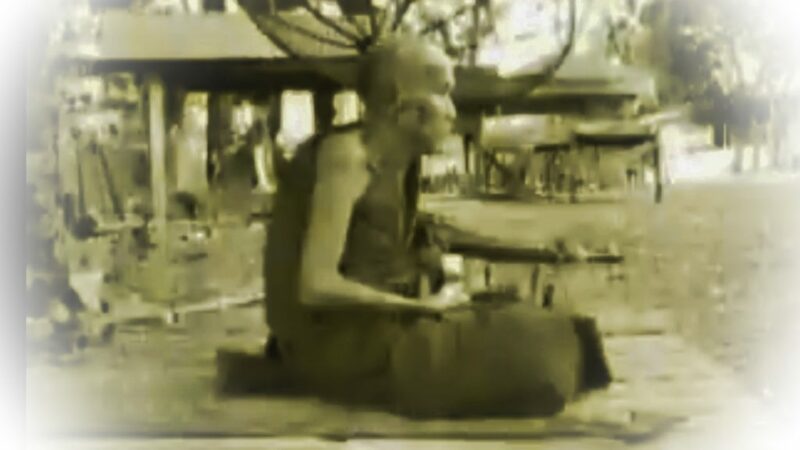 He received te ‘Chaayaa’ monk name of Tidta Tammo, which means ‘he who has his Mind and Heart firm in the Dhamma”. After his Ordination as a Bhikkhu, Luang Phu stayed with his Upachayas for 2 years and fulfilled his duties, and studied the Dhamma further. After this, he asked for permission to leave and return to Wat Chon Daen, to continue to learn Wicha Akom Buddha Magic with Luang Por Tob. Once Luang Phu had finished his years of apprenticeship to Luang Por Tob, he then begged leave., and set off on Tudong Solitary Wilderness Wandering, both within and outside of Thailand’s borders. 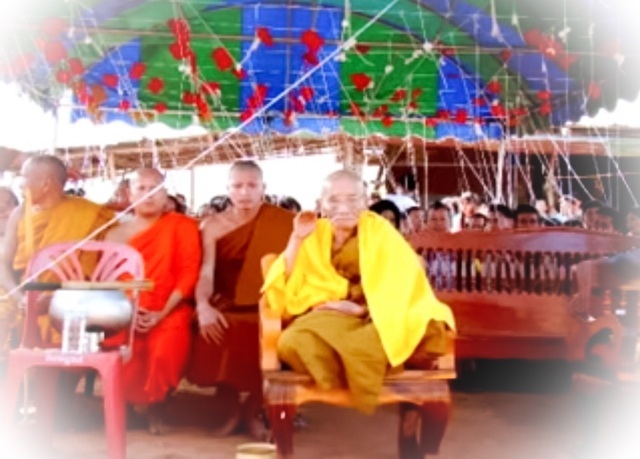 Luang Phu Khui then traveled back to his home district of Ta Eebun, and the Sangha Office elected Luang Phu Khui to be the Bishop of Eebun Municipality, and administrate the Monks and Samaneras of the District. Luang Phu performed this task for a while (roughtly 10 years), but became very bored with the worldly administration tasks, and asked to resign, and return to his practice of Tudong Forest wandering in Solitude. Once he had set out once more on Tudong, he traveled to Jampa sak in the southern Jungles of Laos, and then further south into Cambodia. he met many Kammathana Forest Monks and Ruesi in his travels through the forests of Laos and Cambodia, from whom he received the Wicha of Somdej Lun of Laos from Kroo Ba Daeng, and Lao-Khmer Sorcery from Luang phu Gromsorn (Luang Phu Rod), of Wat Nong Phai, in Khon Gaen. From 2512 BE to 2517 BE, Luang Phu returned to Wat Chon Daen, to serve his Kroo Ba Ajarn Luang Por Tob. Now that Luang Phu Khui had gathered much experience on Tudong, and increased his Prowess, Luang Por Tob began to reveal his complete Compendium of Wicha, bestowing all of his knowledge to Luang Phu Khui. It was here that Luang Phu Khui was able to receive the most highly sought after Wicha of Luang Phu Sukh, of Wat Pak Klong Makham Tao, and was able to meet and receive Wicha from Luang Phu Pra Maha Po, of Wat Khor Mon and Luang Por Mui, of Wat Don Rai. 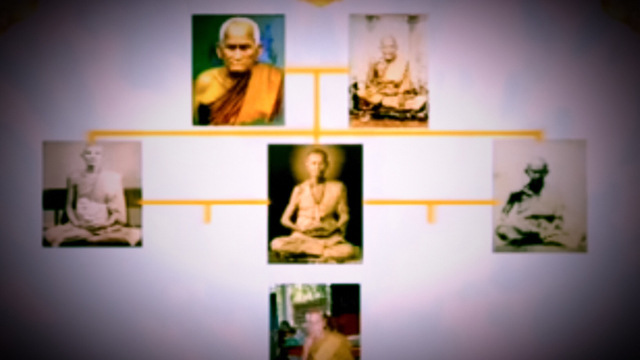 Wicha Lineage; Luang Por Ngern passed Wicha on to Luang Por Pit, of Wat Khamang, who passed the Wicha of LP Ngern down to Luang Por Tob, of Wat Chon Daen , who passed it down to Luang Phu Khui. In the Year 2517 BE, Luang Phu Khui was traveling on Tudong in the area of the Mountain Ranges of Petchaboon, when he came across the area of Ban Tam Duang. He saw the village, and foresaw how it would become in the future, and in addition saw the peacefulness of the area, its waterfalls and river and natural forests fitting for Dhamma practice, and decided to ‘Pak Glod’ (stake his meditation umbrella) under a tree and stay to practice here. He thus stopped wandering, and the local devotees came to find him in the forest, and invited him to remain and help build a temple where he was practicing at Sap Takian. The Village of Sap Takian was a small hamlet in the forest, that was full of wild beasts such as tigers and elephants, and poisonous reptiles and insects. It was about forty kilometers through deep forests to get to the nearest small township, and would take weeks to cross the difficult mountainous terrain. So when the locals of the forest village of Tham Duang would become ill, Luang Phu Khui wold collect forest herbs and make healing potions instead of taking the long journey to go and buy medicines. He once healed the whole village of an Epidemic with his magical potions. Many devotees of the surrounding villages and townships began to hear of Luang Phu’s amazing healing powers and potions, and came to heal their ailments. Luang Phu would invite the folk to come and keep the precepts and listen to the Dhamma, and learn how to Practice, which instilled much faith in them, and people began to come to practice. The temple began to develop, donations came in, and help from the Folk increased constantly. The little Kuti Hut the Folk had built for Luang Phu, was not to be accompanied by the ‘Senasana’ ancilliary buildings, which would become the Temple we know today as Wat Sap Takian. Luang Phu was elected to become Abbot by the Sangha and by the Local Devotees request, and he remained there, and completed many projects including the building of the Uposatha Shrine Room, Sala, and Ancilliary Buildings for Monks and Devotees to practice Dhamma. He remained always available to help the local folk, teach Dhamma, and Bless them, and help them with his magic, and amulets, until the day of his passing. His many editions of amulets, which began appearing sometime in the early 2540 BE – 2545 BE period and onwards, are extremely sought after and now very rare, for their renowned Klaew Klaad and Metta Maha Niyom Powers. It is very difficult to find his amulets these days since his passing. The Look Om Chan Hmak of Luang Phu Khui is said to be Miraculous, and has had various stories of miraculous events in the news with people surviving deadly events, who only wore the Chan Hmak Betel-Areca Ball of Luang Phu Khui. One man was thrown off his motorcycle and the bike was completely smashed to pieces, but the person was unharmed without a scratch. All he had with him was the Look Om Chan Hmak of Luang Phu Khui.Immense fervour arose after a Policeman was shot at point blank range by a Criminal, and the gun refused to fire, saving his life. The event was covered in national News Agencies, and remains unexplained to this day;The Policeman was astounded as he was on a Mission, and the Criminal Suspect Fired at him at Point Blank range, that the Gangster’s gun would not fire repeatedly. 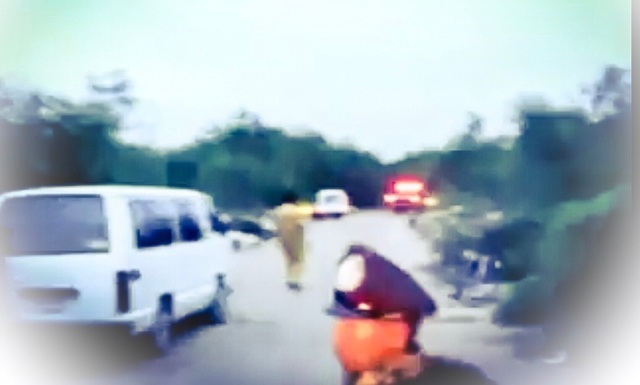 The Policeman was able to survive the incident, but was curious as to if it was because of the Chan Hmak of Luang Phu Khui he was carrying at the time. So he decided to break the rules of amulets, and put it to the test with his revolver by shooting at it. 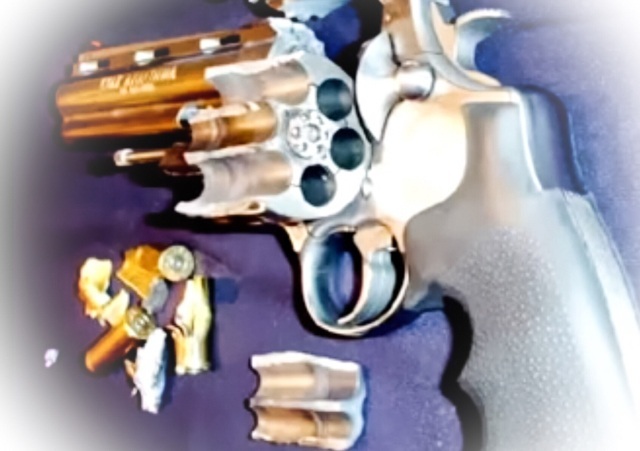 The gun would not shoot repeatedly when he pointed it at the Look om Chan Hmak. So the Policeman pointed the gun at the ceiling, and tried to shoot again, The gun still did not shoot, but it broke in half and caused an injury to the policeman’s hand, as if it was punishing him for being impetuous with the Wicha which had saved his life. The Policeman’s gun was broken, and he had to be treated at the Infirmary to fix his injuries. The Policeman had to be treated in hospital for the damage done. The testing of amulets with guns is in truth forbidden as rules of the Kroo Ba Ajarn, and the sacred Power of Amulets os meant to be reserved for saving lives, not for testing the power. This should always be remembered, and respected, that the power of an amulet to deflect or forbid bullets, should be left for when it is needed, and ot be wasted trying to satisfy curiosity, or deal with doubts.